● Head-wracking puzzles with many solutions. Use your balloons wisely! ● Adventure through a gloomy industrial city. Feel the sadness that you try to repel! 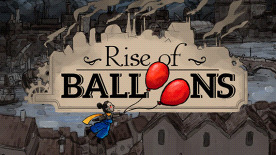 ● Multiple balloon types allow you to fly, destroy obstacles or glue stuff together! ● Simple and intuitive controls allow you to concentrate on solving the next challenge! ● Listen to beautifully composed music by Productions Musique Nordique!